Renderplas PVC external render beads are part of the dynamic design of The Walk, a new commercial and leisure development in East Riffa in the oil-rich Kingdom of Bahrain. PVC Stop and Corner beads from the Renderplas range, provided an aesthetic and practical solution for the new build project, creating crisp, durable edges to the large external render panels which give The Walk its distinctive geometric form. Also, by using brilliant white PVC beading, rather than a metal alternative, the desired finish was achieved with no need for painting. Non-corrosive and UV resistant, Renderplas PVC beads will withstand the intense heat and humidity of Bahrain’s summer months, ensuring that the project stays looking fresh and new for longer with minimal maintenance. 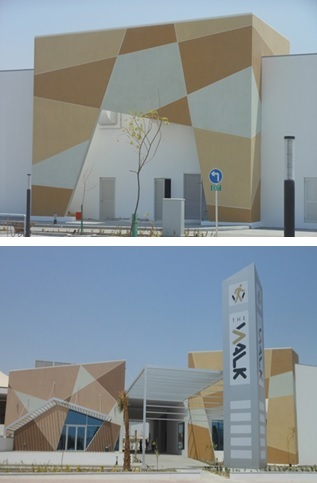 The first of its kind in Bahrain, The Walk is an open air mall with high-end shops, an art gallery, cafés and restaurants. Renderplas PVC beading was supplied for the project by Gulf Markets International (GMI) of Bahrain, a longstanding distributor of Renderplas products in the Gulf Region. A total of 12,000 linear metres of Renderplas 6mm Stop Beads were installed to edges of the building’s external render panels. Designed to be seen, the bead edges enhance the overall aesthetics of the dramatic segments which make up the striking structure. Additionally, 2,500 linear metres of 4mm corner beads from the Renderplas range were used to provide protection and create a sharp finish to external corners. 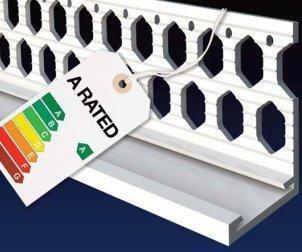 In addition to excellent aesthetics and durability, Renderplas PVC profiles are easier and safer to handle than cut metal. They offer a simple, one-man solution for creating straight, durable joints, corners and edges on all external and internal rendering. The PVC material is scratch resistant and will not discolour over time, so any exposed joints and edges will continue to complement the colour of an external facade indefinitely.